This is Walky Walky. It is a snack for hippos, which are often kept on leashes by Japanese people (J-people, as they prefer to be called). I know the hippo in this picture is not on a leash, but heck, sometimes you just have to go wild, right? Because space is so tight in Japan, hippos are of course miniaturized- like bonsai trees, or chihuahuas. They live in tanks like fish. 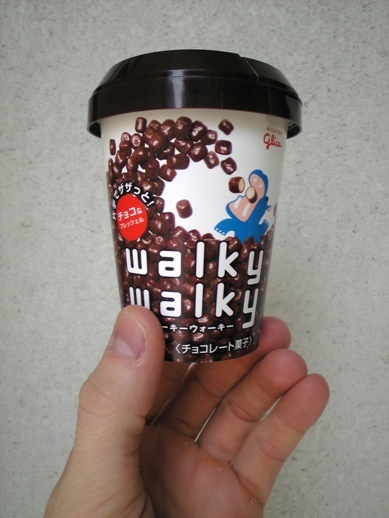 Every morning, sprinkle some Walky Walky chocolate bits (in three flavors, choco, strawberry, and bitter) into their tank as if they were fish. The Japanese for ‘hippo’ is ‘bakakaba’, which means ‘stupid pig’. I guess they don’t have much respect for their pets, hmm? You didn’t actually mention anything about the chocolates themselves! What do they taste like? How much do they cost? Where can they be bought? Ironic that I just saw this product for the first time today, and here it is on your site! I’ll admit I had a look at it and considered it for a post on my site as well. Wow, now I have competition! Good spoof, but yeah, what are they like tastewise? hippo is bakakaba? I thought hippo was just kaba. Is that a joke as well? The chocolates are great. I’ve eaten 3 packs already- 2 choco and 1 strawberry. What do they taste like? Hmm. They have a bit of crunch to them, as you guys will know I like- plus some good chocolate. I think they’re great. Opening the pack is fun. Maybe you could blog that Mike, with photos? 😉 You push the foil through with your thumb- then eat/drink/inhale the little hippo flakes like you’re knocking back a beer. Only problem- addictive, and too easy/fun to eat. You can buy them in convenis (dunno which ones) and they cost something like 150 yen. Mike- yes, it’s just kaba.